Do you want to unlock tone and feel a new vocal freedom? Do you want the tools to correct the habits that trip you up vocally? Do you want to acquire and understand the vocal skills that you can count on when it matters the most? Do you have a vocal issue that you would like to surpass or leave behind? This workshop was last held in Brisbane 2015 please email us to book a Transform Your Voice workshop in your area. When you secure your place at our next intensive vocal workshop you will get a massive injection of self-growth as an artist and singer - no matter what style you sing. A new BONUS for 2015, you will also receive our comprehensive, 12 month online vocal course the: Elite Vocal Series to give you all the extra support you need following the intensive weekend. It’s 2 days you can’t afford to miss! EVERY participant receives our 12 month, online Elite Vocal Series which can be used as soon as you have registered, in preparation for the workshop and after, to really consolidate your learning - check out all the great stuff included here. Now with more than 30hrs of cutting edge vocal tuition including the online 2015 bonus! PERFORMER – for those wanting to participate in the full, hands-on workshop experience. OBSERVER – for those wanting to watch others go through the workshop experience. 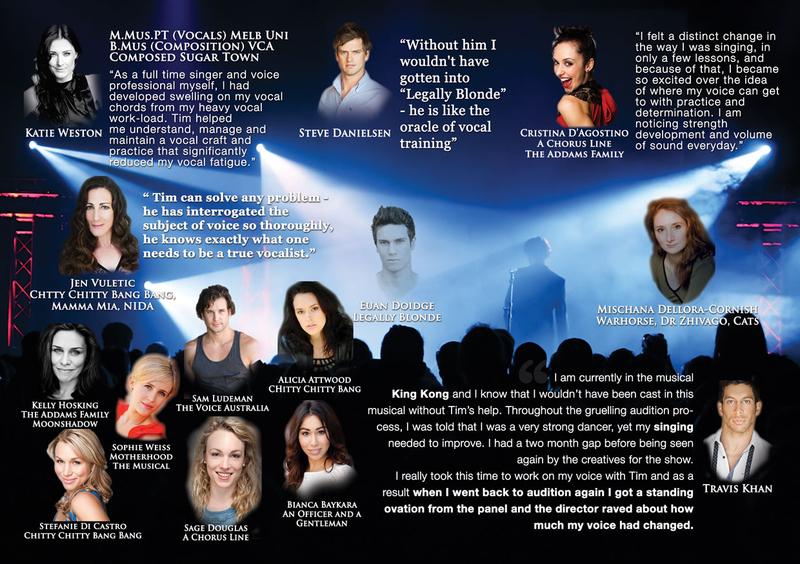 Solo Masterclass with Tim on vocal technique, song interpretation and technique application, audition preparation, your time to have any vocal problem diagnosed and fixed. Primal State – the actor/the self, Mixed Vowels – vertical and horizontal, Variable Vocal Support and Breathing – balancing the legit and the contemporary, Emotional Laryngeal Adjustment, Mixed Vocal Onset – the continuum, Thyroid Tilt vs Horizontal, Twang/Squillo in the Mix. Strictly limited to 15 performer and 20 observer places. Need more assistance? - email us!